Writer-producer Sebastian Junger, singer-songwriter Stevie Nicks, quarterback Peyton Manning recognized for their support of troops and their families. 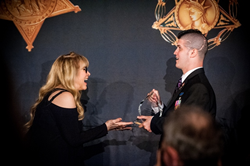 Stevie Nicks accepts USO-Metro Achievement Award award from wounded warrior Vincent Mannion-Broduer. Senior military leaders, celebrities and corporate partners flocked to Arlington, VA and were all in attendance at USO-Metro’s 33rd Annual Awards Dinner on Tuesday, March 24, 2015, as part of their Special Salute to Medal of Honor Recipients. Partnering with the Congressional Medal of Honor Foundation, USO-Metro recognized 27 Medal of Honor recipients for their courage, sacrifice, selflessness, and patriotism. USO-Metro also presented awards to singer-songwriter Stevie Nicks, Denver Broncos quarterback Peyton Manning, best-selling author/Oscar-nominated filmmaker Sebastian Junger and poet/art therapist Seema Reza. Together, with more than 620 attendees, USO Metro devoted the evening to honoring the service and sacrifice of Armed Forces both today and throughout history. Among the many Medal of Honor recipients honored, three were from Afghanistan. These individuals included Salvatore A. Giunta, Clinton L. Romesha and William D. Swenson. As part of the star-studded affair, Nicks was awarded the 2015 USO-Metro Achievement Award by Corporal Vincent Mannion-Brodeur - who was severely wounded in Iraq after being hit be in IED and who Nicks has kept in touch with over the years. The singer holds the record for the most hours spent over a five-year period visiting combat-wounded service members as part of USO-Metro’s celebrity handshake hospital visits. Nicks has also donated hundreds of iPods filled with music to those recovering at the then Walter Reed Army Medical Center and Bethesda National Naval Medical Center. The singer was so moved by her visits with troops that she wrote the song “Soldier’s Angel,” which was released in 2011 and appears on her “In Your Dreams” album. Bestowed the 2015 USO-Metro Merit Award for his support of wounded warriors and deployed troops, Manning has also visited wounded, ill and injured service members at Walter Reed National Military Medical Center at Bethesda as part of USO-Metro’s celebrity handshake hospital visits. In 2013 he even participated in his first USO entertainment tour, where he visited with thousands of troops stationed in Afghanistan, Djibouti, Germany, Italy, Spain and the United Arab of Emirates, as well as the USS Stennis. The 2015 USO-Metro Legacy of Hope Award was presented to Sebastian Junger. One of America's most acclaimed writers, Junger was honored for his heart-wrenching storytelling of the challenges military members endure during combat and upon returning home as depicted in his film "Restrepo, Korengal and The Last Patrol." Presenting the award was Colonel Ostlund, the former commander of the battalion that hosted Junger and the late Tim Heatherington, as they documented the actions of Battle Company in the Korengal Valley, Afghanistan. The evening capped off with the 2015 USO-Metro Colonel John Gioia Patriot Award, which was presented to Seema Reza, who has spent years working with wounded, ill and injured service members at military hospitals and the USO Warrior and Family Centers at Fort Belvoir and Bethesda. Reza regularly conducts workshops to help service members recovering from visible and invisible wounds express themselves through art, writing, film and music. The USO of Metropolitan Washington-Baltimore raised a record $725,000, which will help operate its 10 USO Centers, including two of the largest USO Centers in the world - the USO Warrior and Family Centers at Fort Belvoir and Bethesda. The USO Warrior and Family Centers provide programs and services to the nation’s wounded, ill and injured service members and their caregivers. Funding from the dinner also helped USO-Metro provide critical programs and services to the 300,000 military members and their families living throughout the Washington-Baltimore region and the 150,000 who travel through our local USO Airport Lounges. Other special guests in attendance included Chef Robert Irvine, Miss America 2015 Kira Kazantsev and World Wrestling Entertainment’s Mark Henry and Jim Hart. The Boeing Company was the presenting sponsor and DynCorp International served as the Gold Sponsor. “Being able to showcase the amazing support of people like Stevie Nicks, Peyton Manning, Sebastian Junger and Seema Reza, all of whom truly understand the magnitude of the service and sacrifice of our nation’s troops and their families, symbolizes the support of the American people for members of our Armed Forces and that just makes us all feel so proud."